Roarke's hunt for her takes him across three states...while in a small coastal town, a young father and his five-year old son, both wounded from a recent divorce, encounter a lost and compelling young woman on the beach and strike up an unlikely friendship without realizing how deadly she may be. As Roarke uncovers the shocking truth of her background, he realizes she is on a mission of her own, and must race to capture her before more blood is shed. 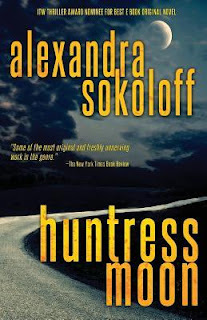 A few weeks ago, the fifth instalment in screenwriter-turned novelist Alexandra Sokoloff's ripsnorting 'Huntress/FBI' series, Hunger Moon, was released. If you're new to the adventures of vigilante killer Cara Lindstrom and FBI Special Agent Matthew Roarke, then lucky you: you've got lots to look forward to! When I first tried one of these books, I ended up buying and devouring three titles back-to-back-to-back in one weekend. Compelling is a reviewer cliche; here it's an understatement. Sokoloff is a master storyteller, who keeps action and pace high while threading her dark tales with plenty of thought-provoking themes, vivid imagery, and memorable characters - all while keeping we readers wobbling on the edge of our seats, unsure quite what to think or feel as events unfold. The series began with Huntress Moon, which adroitly managed some impressive sleight-of-hand: it upends some classic serial killer thriller tropes while in of itself being a superb serial killer thriller. There are many very impressive aspects to Huntress Moon, which all add up to it just being a heck of a good read. The storytelling is seamless, and works on multiple levels. If you're looking for a fast-paced, adrenalin-pumping tale, then Sokoloff delivers spectacularly on that front. But then she layers in much more too: issues and themes that are unsettling and stay with you beyond the final page. There's depth and richness to the settings, the characters, and the underlying story. It's the kind of book that matches 'airport thrillers' for pace and suspense, but feels much 'bigger' and richer. I found myself cajoled, concerned, compelled. Different readers might identify more with Lindstrom or Rourke, the two main characters. For me, I found both fascinating in different ways, and their growing interplay hints at fireworks to come in the ongoing series. Huntress Moon is the kind of book that immediately has you rushing out to add the rest of the author's work to your bookshelf.